I’ve heard countless women…good women, humble women, godly women… pray for God to please move in their husbands’ lives to bring them to a place of ministering together. I love that thought. I love the idea of husbands and wives in ministry together and I’ve been blessed by countless husband/wife duos who serve God together, arm in arm. I love the husbands and wives that co-teach Sunday School. The husbands and wives that co-lead Celebrate Recovery teams. The husbands and wives that open their homes together for small group Bible studies. I love it. But I’m not going to pray for that anymore. Ever. I’ve been guilty of that before. My husband is not what you would call a social individual. He’ll talk to anyone who approaches and he’ll give them the shirt off his back, but he won’t seek out someone to talk to. In fact, he’ll do his best to stay out of the way by himself. So, praying for God to bring him to a place of ministering with me in church, in groups, was just asking God to make my husband someone who he isn’t. But God stopped me in my tracks. In one weekend God managed to show me three different ways that He was using my husband, right where he is. First, we got a message from a soldier that Bob and I met on the WWP Soldier Ride last November. My “I don’t need friends” husband had befriended a younger Vet on the ride and talked to him at great length about overcoming some of the obstacles that he had in his life. He shared candidly about his own problems and how slowing his life down and focusing on God had saved him from a world of hurt. This young Vet wrote us to thank Bob for believing in him and for sharing with him and to tell us that he’d gotten himself squared away and was going to church. Bob ministered to this guy – not in our church, not in our home, but right where he was. Second, we got a phone call from a very good friend of ours who happens to be a Captain in the Army. One of the men he had served with in Iraq was out of a job, living in a very poor community, and needed help. He asked Bob if he would call him and see about helping him find some work. Bob immediately got on the horn and called this young man, offering him some hope. Again, he didn’t meet this soldier’s needs in our church or in a Bible study in our home, but he used Bob right where he was. And last but not least, we attended a minor league baseball game with some military friends of ours one very hot, steamy, Florida evening in July. The heat index was well over 100* in the shade and we were already feeling miserable before the game began. A few rows above us on the other side of our section we heard a woman start screaming for help. Her elderly mother had passed out in the heat. My husband did not hesitate to join the first responders that came to her aid. Although he never had a chance to put his schooling into practice, my husband graduated from med school a few years ago at one of the best med schools in the country. He never thought twice about being bothered to help her. He knew what to do. He knew how to help. And he didn’t give it a second thought. Not in a church. Not in a Bible study. But at a minor league baseball stadium. I will never again pray that God will form my husband into the man that meets my expectations of ministry. God’s plans are so much better than mine and He has a much better idea of how to utilize my husband in His kingdom work than I do. Maybe he doesn’t speak to congregations. Maybe he doesn’t pray over large groups. But to the individuals God has used my husband to reach, he was a blessing. And what more could a wife truly ever want than to know that her husband is right where God wants him? They say that men are like waffles; women are like spaghetti. Men can easily compartmentalize things while women tend to connect and intertwine every thought, event, and action like a big ole pile of slippery spaghetti. It seems like everyone from your mother to your mechanic has advice to offer on a daily basis. We love to criticize the media for their role in negatively impacting our self-esteem but the same barrage of criticism in the form of advice often comes from the pulpit, the women’s Bible study, and our own posts on social media. And not all criticism is bad. Constructive criticism has saved me from many poor decisions. Yet, how do I sift through the onslaught of advice I receive every day? I wish I was a waffle. But I’m not. It takes me forever to detangle the mess of critical remarks that the world throws my way… especially when they are conflicting comments. You know exactly what I’m talking about. *It’s good to get up early before your children so you can pray, spend time with the Lord, and enjoy alone time before your day begins. **A tired mommy does nobody any good. Get plenty of rest so that you can be the mom they need. *We need to cleanse our bodies from the impurities that we put in them. It’s important to drink water, eat healthy foods, and get plenty of exercise every day. **It’s harmful to compare ourselves to others. Be happy with who you are and what you look like. We can’t all be a size 4. Embrace your body the way it is and stop living for the acceptance of others. Besides, God loves you just the way you are. *If you make a commitment, you should keep it. **Your family should always come first. If they need you, you should break all other commitments. *It’s our job, as parents, to protect our kids from the outside world. **If we shelter our children, we are not providing them with opportunities to learn and grow. That’s why it’s so important to have Truth to filter such comments through. While it’s certainly a blessing to have experts in the fields of medicine, marriage, health, children, employment, and so on, there’s only one Expert that I know will never give me conflicting advice. It’s not easy to know what to do. It’s not easy to make decisions as a mother, a wife, a woman. It’s not easy to muddle through the piles of advice we receive every day and to clearly discern which advice is worth applying to our lives and which advice should line the bottom of the bird cage. And often both sides of conflicting advice are good…. given the right circumstances. Only God knows the plan He has for our lives. So ultimately, it should only be Him that we seek when we are unsure of what to do. Only he can make a waffle decision out of my pile of spaghetti. When dealing with difficult people who like to raise their voice and yell at me, I’ve often found the best way to respond is to whisper. When I lower my voice, people feel less threatened, the situation deescalates, and they want to know what I’m saying. The whisper is an amazing tool in the world of communication. It stirs up many emotions inside of us, bringing us feelings of deeper intimacy and closeness. We love it when our spouses whisper loving words in our ear. We melt when our little ones whisper a secret. We read in 1 Kings 19 that God even spoke to Elijah not through the burning fire, not through the violent wind, but through a gentle whisper. A whisper can usher in life. However, when placed in the enemy’s hand, a whisper can usher in death as a weapon of destruction. Knowing the full capabilities and powers of a whisper, the enemy uses it to lure us into safely believing the words we hear. When the enemy shouts at us, we recognize the assault and readily reject it. But when he whispers, if we are not on guard, we can fall prey to his enticement and become ensnared in his wicked ways. You have to be careful, dear sisters, to interpret what you hear. The voice of God can be difficult to discern from the voice of the enemy. For example, the enemy may whisper that you’re too fat and that you’re husband doesn’t find you desirable any more. God will whisper that He loves you just as you are and wants you to turn to Him to help you become healthier so you can live the life He has planned for you. Do you see the difference? The enemy breathes death but our Savior breathes life! The subject is the same but the message is very different. 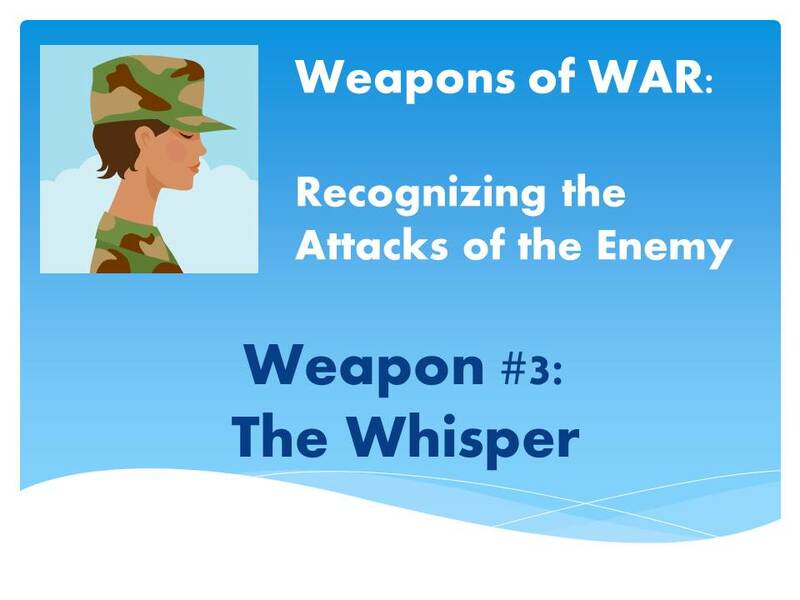 So now that we know how to recognize the whispers of the enemy and we know how he uses them, what can we do about it? Thankfully, God gave us the armor we need to defend ourselves from this weapon. Right now, I want you to look down at your index fingers. Hold them up! Now, place them in your ears, smile, and sing loudly, “Lalalalalalalalalalalala I can’t hear you satan!!!!!! !” James 4:7 says, “Humble yourselves before God. Resist the devil and HE WILL FLEE!” That’s a promise! God gave you holy fingers to plug your ears so that you can resist the whispers of the evil one. Sisters, do not be afraid! Your God has given you protection over every weapon in that coward’s arsenal. Praise Him! It’s no surprise to us that the enemy likes to creep around in the dark. Most crimes are committed at night, after the sun has gone down. That’s when we’re the most vulnerable. We can’t see the danger around us and our attackers can sneak around undetected. At the time of day that we are ready to relax, let our guard down, and rest the evil in our world rises from the shadows and attacks. Satan is no different than the common criminal on the street. He preys upon our vulnerability. He waits for us to shut our eyes. That’s when he pounces. The Bible says that satan blinds the minds of unbelievers to keep them from seeing the Light of the Gospel of the glory of Christ (2 Cor. 4:4). He doesn’t have that kind of power over those of us who have given our hearts and lives to Jesus but that doesn’t keep him from trying. Satan uses the darkness to his advantage to prey upon the weak but he uses it as a weapon against those who stand strong with the strength of Christ. If we’re not guarded, we may find ourselves covered in a mask of darkness. But don’t worry, Jesus has already overcome the darkness. So how do we protect ourselves from this weapon of a mask? Step #1- Keep your eyes on Jesus. When you stay fixated on the Light, the darkness has no room to creep in. Step #2- Pray for night vision goggles. Our soldiers use them in the dessert to see the enemy approaching at night. They can launch a counter-attack before the enemy can even get within range of hurting them. Being prepared is key. The best offense is a good defense. But we all have momentary lapses of doing the right thing, and we turn our eyes elsewhere. So, what do we do? Step #3- Pray for open eyes. God WANTS us to bring our A-game onto the battlefield. He is more than ready to rip the blinders off for us. We just have to ask Him. But what do we do when we realize we’ve been stuck in the dark for a long time? Won’t ripping the blinders off hurt? Step #4- Pray for new eyes. Our God is a God of second chances. And third chances. And five millionth chances. Are you afraid to see what’s in front of you? Are you afraid of the light? Ask Him for new eyes. He’s a merciful God. He will give you eyes that are ready to embrace the light and see the truth in love. 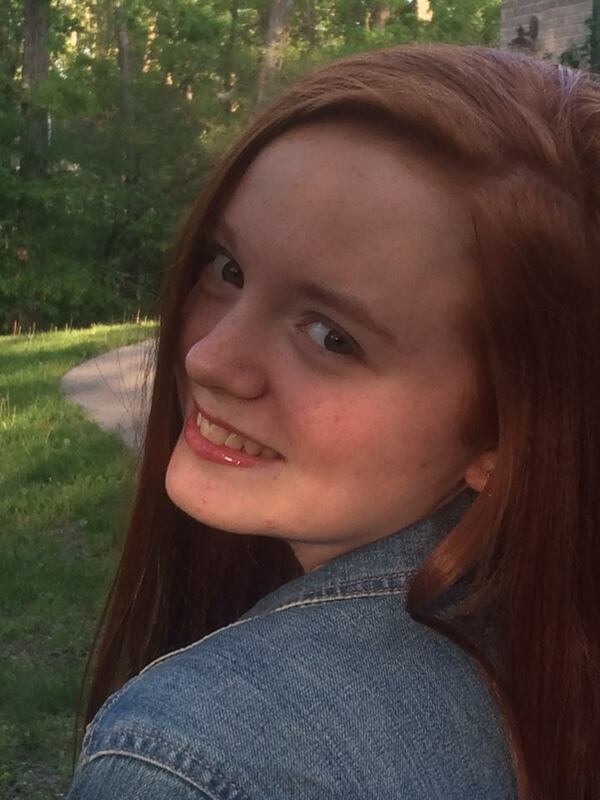 When my husband and I have arguments, I used to pray, “God, please help him to see that he’s wrong.” Then God started working on my heart and I began praying, “God, please just help him to see that I’m right.” God did a little more work in my heart and I began praying, “God, please just help us to see the same thing.” Now I pray, “God, help us to see each other through YOUR eyes.” A dear friend of mine used to say that every morning she would pray for God to give her new eyes to see her husband. I think this is a beautiful prayer and I try to remember to pray it often. When we see our husbands through new eyes, we can more clearly see them the way God intended us to. And seeing the light of God’s truth makes the darkness flee. 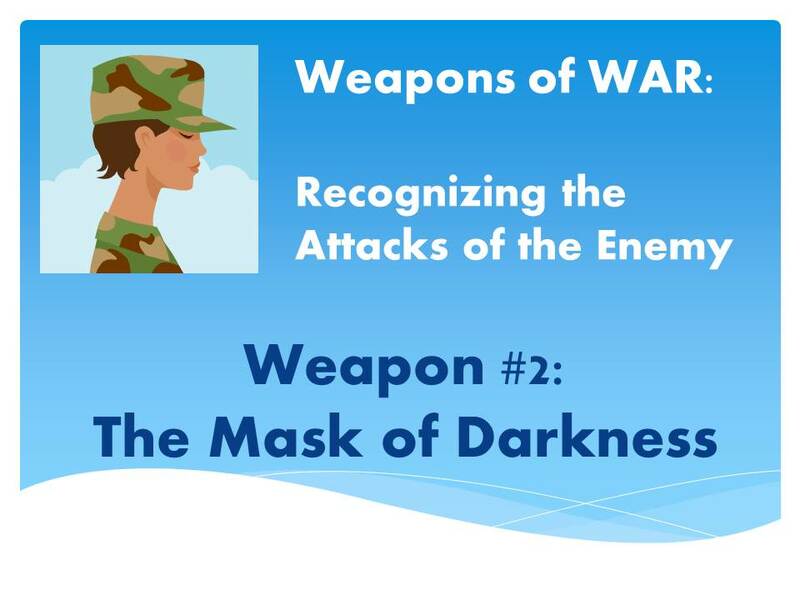 As promised, here is the first in a series of devotionals for military wives about the weapons the enemy tries to use against our marriages. 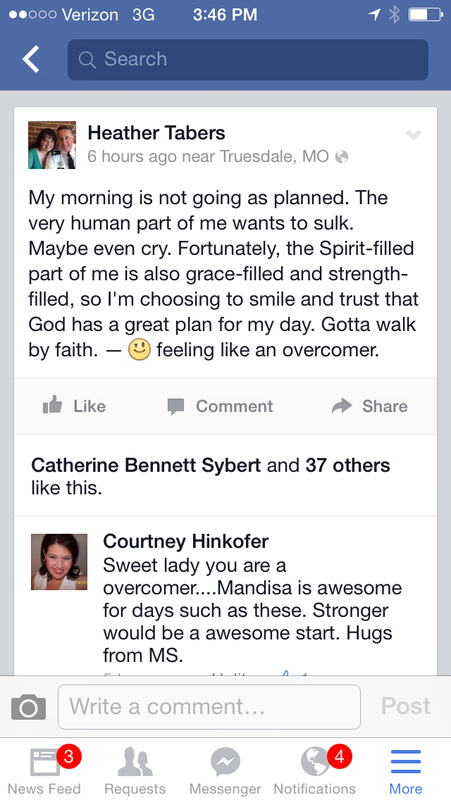 These devotionals will also be located under the tab at the top of my page called “WAR Ministry”. Please feel free to check back there often for future devotionals. You may have expected something a little more threatening for our first weapon to study. 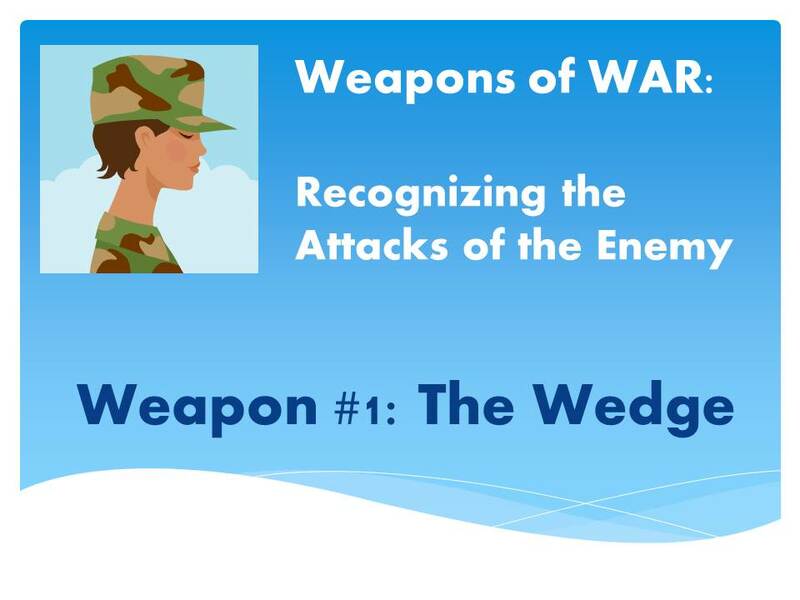 You may also be wondering how a wedge could be considered a weapon, yet this is one of the adversary’s greatest tools in destroying marriages. Have you ever seen someone split wood? In the narrowest of cuts on the top of a log, a wedge can be placed and with one drop of a hammer that log will split in two. That is how the enemy attacks our marriages. He observes the tiny cuts we have- cuts of disagreement, cuts of misunderstanding, cuts of jealousy, cuts of dishonesty. While the cuts themselves are almost unnoticeable and seem to cause us no harm, when the wedge is applied, those cuts are ripped wide open. If our marriage is soft or decayed, the enemy does not even need to apply much pressure. The wedge by itself will cut our marriages in half. If our marriage is strong, the enemy will be required to add more pressure to the wedge. Sometimes we see this pressure in the form of loss- loss of a loved one, a job, a position, a home. The more pressure that is applied to the wedge in the split in our marriage, the greater the division between us. The good news is that God is stronger than any wedge and He gives us His strength and power to defeat the enemy. But what if it’s too late? What if the crack is already there, the wedge is in place, and you’re feeling the pressure. Then what?